CTP flexibles says it has had a dramatic increase in its customer base and in flexible packaging materials demand, straining its slitting capacity and leading to the investment in three new Titan ER610 slitters. The company’s existing slitter rewinder capacity, consisting of a 1650-mm and a 1350-mm Titan ER610, were installed in 2010. CTP flexibles manufactures specialized plastic extrusion and flexible packaging for the food, beverage, confectionery, industrial and general merchandise industries. The company extrudes high-density, low-density and linear low-density polyethylene films, as well as produce cast polypropylene films. The company also runs laminations, multi-layer films and shrink films, including bags, pouches and shrink sleeves. 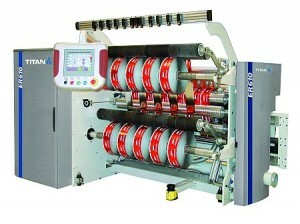 Atlas Converting Equipment Ltd. says it has sold more than 100 of its Titan ER610 compact slitter rewinders. The system is available in two web widths, 1350 and 1650 mm (53 and 65 inches), with a maximum rewind diameter of 610 mm (24 inches). The unit features a 10-inch touch screen control system and an integral edge-trim extraction system. The pneumatically controlled braking system handles web tension control and a digital edge-guide system manages lateral movement of the unwind reel to ± 50 mm (2 inches). The three new Titan ER610 slitters for CTP flexibles available include an anti-static control system, laser (line) core positioning, and a new option for shaftless unwind roll pick-up from floor, which will also be retrofitted onto its existing Titan’s. All systems offer shear knives, rotary razor (burst), or razor slitting in air or groove.